Dogs are intelligent animals and they can be trained to perform a host of different actions. As a general rule, the sooner you start training your pooch, the easier and more successful the process will be. By far the best way to train dogs is to use positive reinforcement. This means offering the creatures a reward each time they perform a behaviour you want. The only trouble is, owners often get carried away with handing out edible treats to their canine companions, and this can cause the animals to gain too much weight. Here are some top tips to help ensure your dog doesn’t pile on the pounds as a result of your training sessions. It is really important to note that edible treats are not the only form of reward available to you when you are training your dog. In fact, some dogs prefer to be praised with affection or a game. If you discover this works for your pet, you can forget about handing over titbits. If your dog isn’t interested in learning new behaviours unless there’s the prospect of food as a reward, you should think carefully about the treats you offer. Some foods are much more calorific than others. Particularly if you are handing out lots of treats, it’s vital that you choose foods that are low in calories. For example, rather than handing over meaty offerings such as pieces of sausage, perhaps you could provide small slices of carrot. Try to be consistent in your use of treats too. If your dog is used to getting rich, indulgent treats, it will be harder to switch over to healthy versions. Whenever you’re choosing rewards for your dog, make sure they are safe to eat. Certain human foods are poisonous to dogs. For example, it is not a good idea to give your pet chocolate. If you are unsure about certain products, ask your vet or search for information from trusted sources online. The commercial dog foods now available from firms such as Hill’s Pet Nutrition are complete, meaning there is no need to supplement them with anything else. Indeed, if you start adding to your dog’s diet by dispensing treats, you risk overfeeding it. 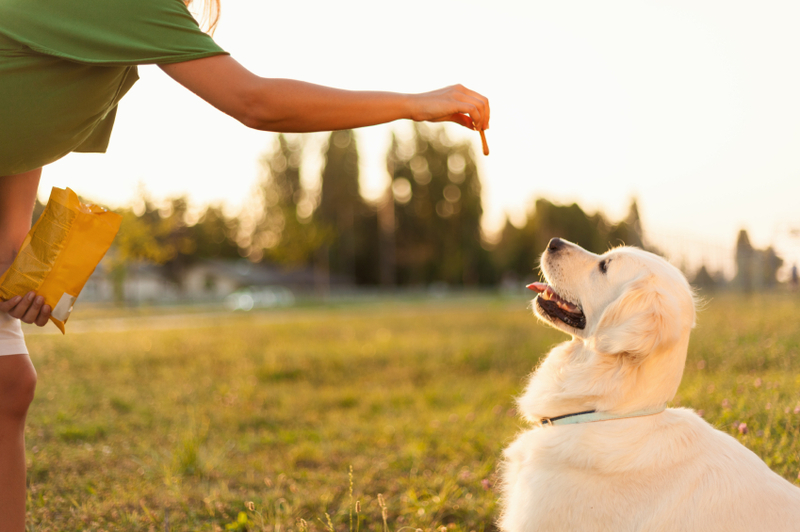 To ensure you don’t fall into this trap, make a mental note of the number of treats you give out during training sessions and adjust your pet’s food portions during mealtimes accordingly. By putting less food in your dog’s bowl, you can help to prevent it from gaining excess weight. It’s also important to know when to stop giving out treats during the training process. Once your animal has learnt the relevant behaviour, there is no need to continue handing over rewards. All too often, owners carry on dispensing treats when it is no longer necessary. By bearing this advice in mind, you should find that you’re able to train your dog without overfeeding it in the process. Dogs, we make a conscious choice to bring them into our home. We feed them, care for them and alter our lives to accommodate them. Essentially they become a member of our family. As conscientious owners we ensure they are fed, exercised, wormed, have flea treatments and veterinary care. Everything is planned from their boosters to worming. What happens when it isn’t planned? The one time they run across the road and get hit by a car? When they eat poison set by a landowner? The puppy who chewed through a power cable? Being caught on a wire fence, cutting their head and ear open? Kicked or crushed by livestock. The list goes on, accidents are never planned, they just happen. If you or a member of your family is hurt you call 999 and help arrives, you would be stabilised and taken to see a doctor. For your dog, you are the emergency help, your immediate actions can make the difference between life and death, buying time before you see the vet. We invest time, love and money into out dogs and pets; I am keen to give owners and businesses (who look after other peoples’ dogs) the confidence to be able to act the one day it all goes wrong. As a soldier in the Royal Army Veterinary Corps and as a pet dog owner I have treated and stabilised my own dogs and other peoples from shrapnel to cut pads. Seeing the helplessness and distress in someone as their dog suffers, is hard to forget. So make a difference; show them that you love them when it really matters. 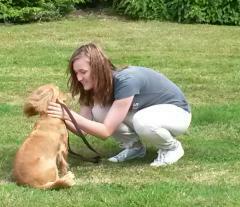 There are courses throughout the year; the next one is on 8th December 2014 at Hearing Dogs for Deaf People. Money from the courses goes towards supporting this valuable charity.